The Wellness Gazebo is a portable gazebo that provides health and wellness information to Illinois State students, faculty, and staff. Condoms and quit smoking kits are available for FREE, along with other resources and giveaways. The gazebo is located on campus each week, usually on Tuesdays, Wednesdays, and Thursdays. 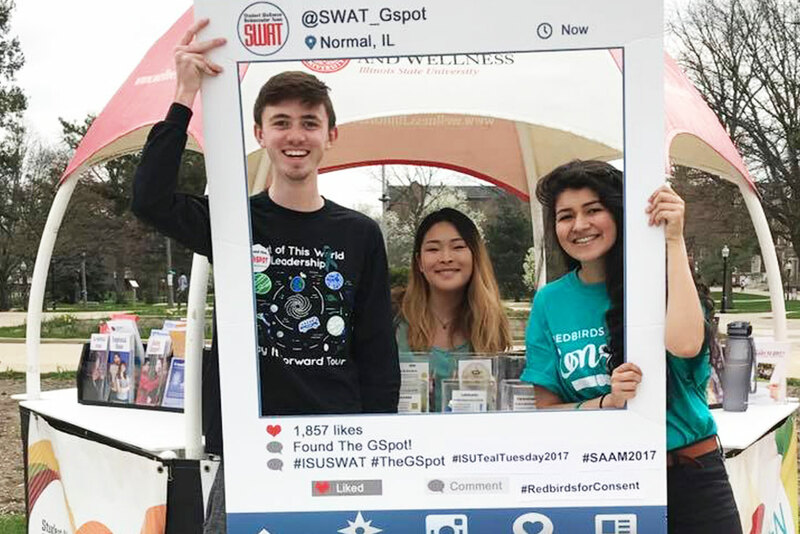 The Wellness Gazebo is staffed by trained Illinois State University peer educators, the Student Wellness Ambassador Team (SWAT). SWAT is a registered student organization open to any students interested in health and wellness. In addition to the gazebo, SWAT members facilitate presentations and workshops on a variety of topics for student groups. For questions about Wellness Gazebo locations and times, scheduling workshops, or information on joining SWAT, please call (309) 438-WELL (9355).